Improve vehicle brake performance and feel with Stoptech Stainless Steel Braided Brake Lines. 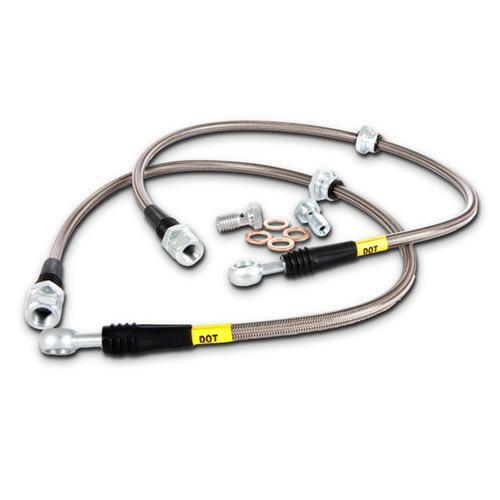 Stoptech Stainless Steel Braided Brake Lines provide a quicker, firmer, more consistent pedal response by maintaining consistent brake pressure. Additionally, stainless steel lines provide precision brake modulation, especially during threshold braking. The improvement in pedal feel is more dramatic on older vehicles where the factory rubber line may have softened and swelled due to age. StopTech brake lines consist of a PTFE (commonly referred to as Teflon) inner line that carries the brake fluid, which is then covered with a layer of stainless steel woven braid. The PTFE tube is very resistant to expansion under pressure and will not degrade from exposure to brake fluid. The braided stainless steel provides support for the PTFE and the weave is extremely durable against incidental impact and abrasion. Next the stainless braided hose is coated with a clear abrasion resistant PVC cover for maximum protection against chaffing and strain relief devices reinforce end fittings. A variety of end fittings are available to meet most application needs. All fittings are engineered for proper fit and durability. All necessary brackets and fasteners are included with each line kit. StopTech brake lines consist of a PTFE (commonly referred to as Teflon) inner line that carries the brake fluid, which is then covered with a layer of stainless steel woven braid. The PTFE tube is very resistant to expansion under pressure and maintains integrity with exposure to corrosive brake fluid. Stoptech braided brake lines protect against the elements of harsh driving conditions. The stainless steel braid provides support for the PTFE and the weave is extremely durable against incidental impact and abrasion. Next the stainless braided hose is coated with a clear abrasion resistant PVC cover for maximum protection against chaffing and strain relief devices reinforce end fittings. Every StopTech brake line is 100% tested in-house to a pressure of 4,500 PSI. This is almost 4 times the typical line pressure exerted by a production vehicle’s master cylinder. 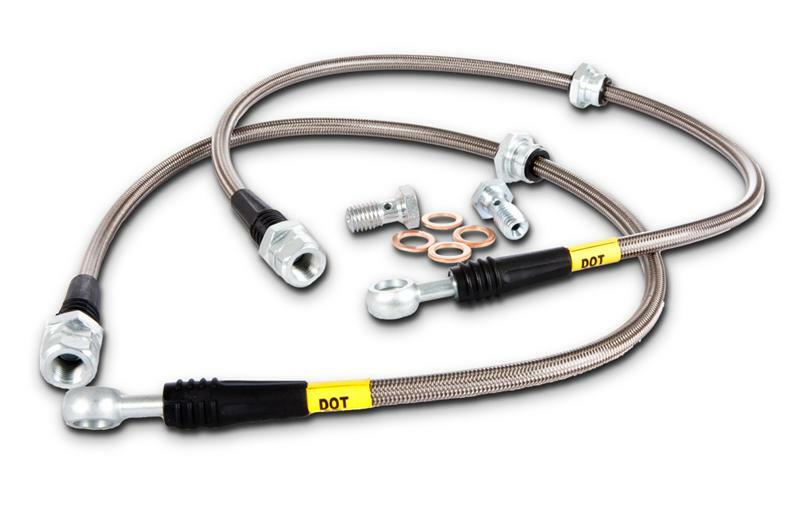 StopTech is a registered brake line manufacturer with the United States DOT and all StopTech Stainless Steel Brake Lines are manufactured to meet DOT Compliance Standards. StopTech Stainless Steel lines also meet or exceed FMVSS 106 and applicable international and EU standards.